A panorama from Chatterton House to St Mary's Parish Church as seen from the Church Lane car park. The Church Lane frontage of Chatterton House just after the opening of the apartments and commercial premises. The smart black door to the right of the man walking away from the camera in the centre of the image is the entrance to the private residences. As I say below, Bang and Olufsen have moved out of their premises on the right of the image, making way for Relish coffee shop. THE transformation of the former Lamb Hotel in Hospital Street into a restaurant, shops and 19 apartments brought a welcome breath of fresh air to Church Lane, replacing a run-down rear yard, with a tin roof visible over the side wall with a pleasing apartments block. A far more pleasing area next to the church, which is one of the town's main visitor attractions - as well as its importance as a place of worship. The front part of the old building (at the foot of this column) retains the original facade. I had imagined that just the very front wall of the Lamb Hotel was to be preserved as a facade but the whole front section has been saved for posterity. 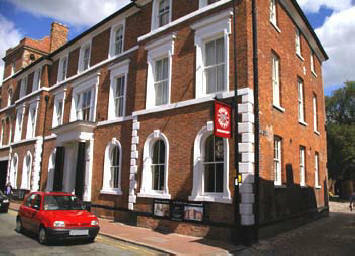 As Muller's, the developers, said in an advertisement in The Nantwich Chronicle back in early 2004, they "were very keen to retain as much of the Lamb Hotel building as we could, but had to replace the middle section of the hotel and the rear section which was little more than a tin roof." Why Chatterton House? I have to confess I didn't know this, but apparently William Chatterton, a groom to Queen Mary, was granted a licence to keep a tavern on the site in 1552. 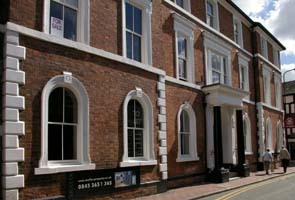 The present building - a Grade II listed building - is 18th Century. I did know that there is supposed to be a tunnel running to the Lamb Hotel site from the adjacent St Mary's Parish Church (or, more likely, the Rectory) - presumably as an escape route for the Rectors in more troubled times. How true that is I do not know. . 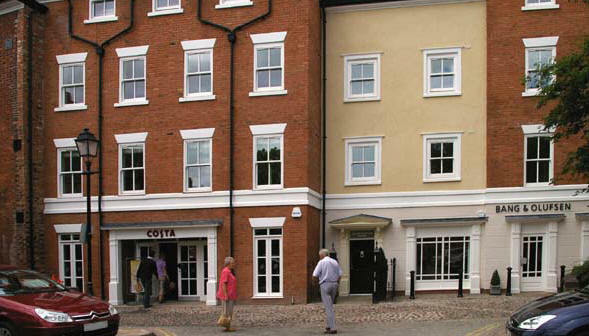 The development includes 19 two- and three-bedroom luxury apartments - including a duplex penthouse - and two restaurants - the Costa coffee shop and the other is the Aroma Cafe Bar. A third, Relish, later moved in to what had started out as the shop of Bang and Olufsen, the home entertainment people. Also in the development at first was Muller's own Property Shop. 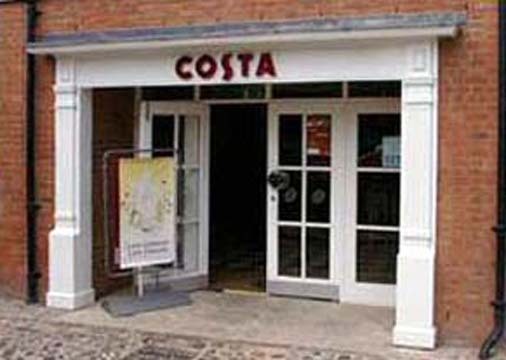 Costa, an Italian coffee shop, still occupies the whole of the Hospital Street/Church Lane corner on the ground floor (above). Aroma has the Hospital Street frontage with the large door (above left). Prices for the apartments started at £190,000, and while - soon after the properties went on to the market, in fact - all were snapped up, some apartments came back on to the market because (presumably) of changing circumstances of the original buyers. According to the Nantwich Guardian at the time of the complete sell-out, there were five unsuccessful people for every successful applicant. 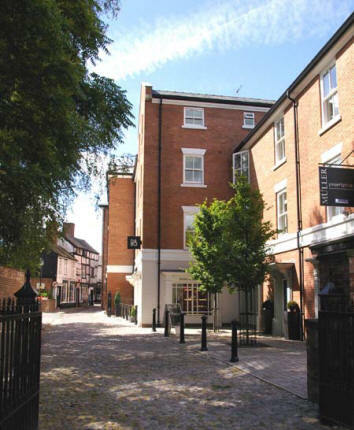 This page is not meant to be an advertisement for Chatterton House or Muller, but anything that improves a run-down site in historic Nantwich is to be welcomed and worthy of mention. CHURCH Lane was closed for quite a bit of the conversion work, and motorists had to use the alternative entrance to the car park, in Hospital Street. The builders' yard also stood at one end of the car park, occupying some of the spaces. 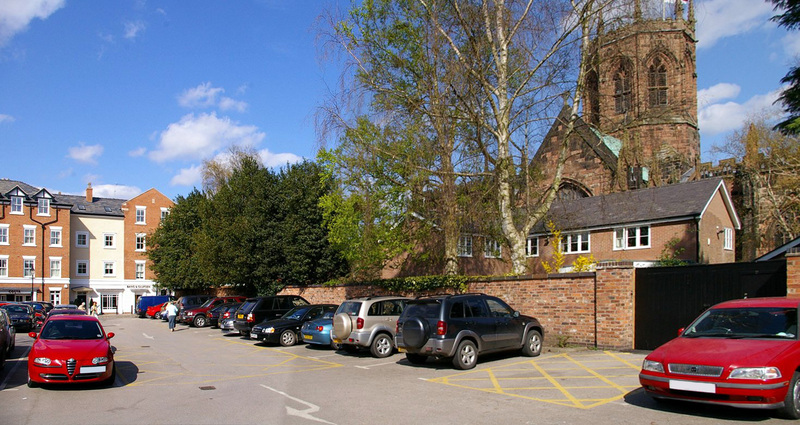 but wedding cars and hearses had to use Churchyardside on the north frontage of St Mary's Church, with a slightly longer journey on foot for wedding parties and mourners. Pedestrians had a very circuitous route around the builders' yard at times. At other times they could walk straight down Church Lane, according to how the work was progressing and what "plant" such as cranes were on site. Now all is back to normal in Church Lane and on the car park, and Chatterton House has proved a welcome addition to the area. Much better than the " tin shed" that used to be there . . . ! Over the months after the work began I ran the latest pictures of the site at its various stages on this page, replacing old ones with updated versions. These are now filed away in "The Brough Collection" but I have retrieved a few to tell the story of the transformation - here. l I later read that the entrance to the car park used to be the site of two cottages and then a free church with the present car park as its churchyard. AS I took the photographs on this page , I remembered that it was in a little seating area behind the bar of the Lamb Hotel about 40 or so years earlier that I had my first taste of cheese and onion crisps, made by Smith's. After that, plain ones were no longer good enough, and maybe a little boring. people will remember, Instead there were potato crisps and a Little Blue Bag of salt in the packet - a little salt in a twist of waxed paper. Yes, you had to add your own in those days. Which you did with great relish - and no thought about the danger of the condiment to your health. Of course, the Little Blue Bag became available once again as one crisp manufacturer turned the clock back. Giving an opportunity for nostalgia or, if you don't want salt, the chance to discard the bag. Little Blue Bag, buried somewhere among the crisps, and tip the contents into the packet of crisps. A good shake of the bag distributed the condiment. Woe betide you if you forgot to do this little ritual. Those "little blue crisps" were a nasty shock to the taste buds. Nowadays, there seems no end to the number of different flavours in crisps. But that first taste was a culinary milestone.